With over 700 million monthly active users worldwide, Instagram has become a necessary platform for marketing. This is especially relevant to millennials who use IG feeds filled with memes, live stories, and appealing posts, as a point of inspiration and discoverability. Having an active profile in the IG community helps companies and businesses to shape its brand identity. Whether it’s your personal brand, a small start-up or a large company, actions like posting, liking, commenting, following, unfollowing, adding the right hashtags, location tags, (everything an Instabot is automated to do), helps businesses to improve. 2 What is Instagram bot? 3 Do Instagram bots work? 5 What is the best Instagram bot in 2019? Businesses become more reputable as their following increases. As a result, brands with millions of followers gain brand exposure and clients’ trust in the product or brand. For this reason, there are over 50 million business profiles on Instagram upping their engagement to gain and keep as many followers as possible. Consumers in today’s information age, demand constant updates in a short window of time. Therefore, Instagram accounts that are less active, have fewer followers. Having said this, being an active user can be extremely time consuming and inefficient. The amount of time it takes to like, comment, hashtag, post, edit photos, research and follow accounts, and unfollow users, could instead, be invested in the company’s development. Instabot users set parameters to target accounts that match specific hashtags. For example, businesses within the fashion industry can enable their Instabot settings to follow, like or comment on posts that use hashtags categorized under fashion like #fashion #ootd #instastyle, etc. Businesses use these Instabots to save time on tedious tasks, by activating the Instabots to run for long periods of time. Furthermore, these tools are easy-to-use and cost businesses no more than $20 per month. Instabots help businesses to grow in no time at an affordable rate. Instagram Bots can follow hundreds of accounts on your behalf. As a result, users end up seeing a huge spike in their number of followers who have “followed-back”. The initial perks of having an Instagram Bot is what entices businesses to purchase this service. Buyers who use Instagram Bots benefit from its immediate results. What might take you 8 hours to do, can take an Instabot less than a second. With more engagement activity, users increase their chances of being seen. This can be hard to do in our fast-paced and impulsive generation, however, Instabots manage quickly and effectively helping companies gain visibility. On the other hand,Instagram automation bot can put a lot at stake. Instabots have been known to place companies and individual users in embarrassing situations like commenting or liking posts that do not align with company values because of its inability to understand context. One user wanted to be recognized for endorsing posts on friendships. Her Instabot was set to comment with a thumbs up emoji on any post affiliated with #friendship. Unfortunately, the Instabot ended up commenting on a post that had to do with a recent death of a friend. This upset the user and their followers. With so many activities on the go, this could become an issue that might not even be brought to your attention. And you can’t expect the Instabot to resolve the issue since Instabots are not programmed to reply-back. Furthermore, if you tried to explain the automation system, followers will lose trust in your brand. This sort of mishap can ruin a company’s reputation. What is the best Instagram bot in 2019? 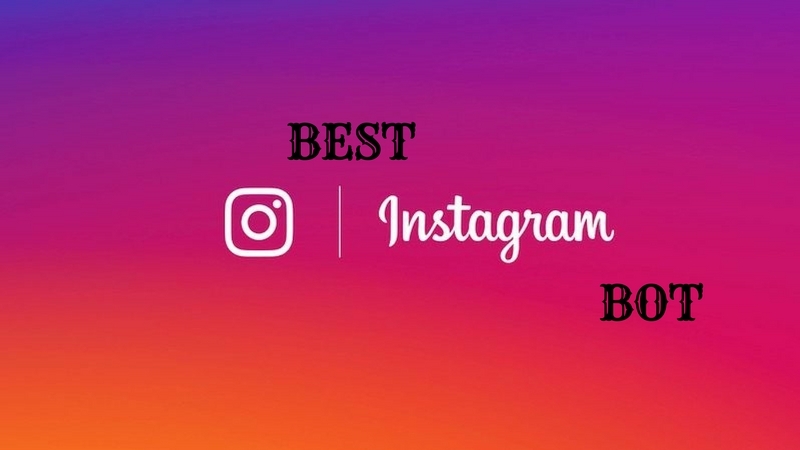 If you do choose to use an Instagram bot, here are two of the best Instabots we recommend. 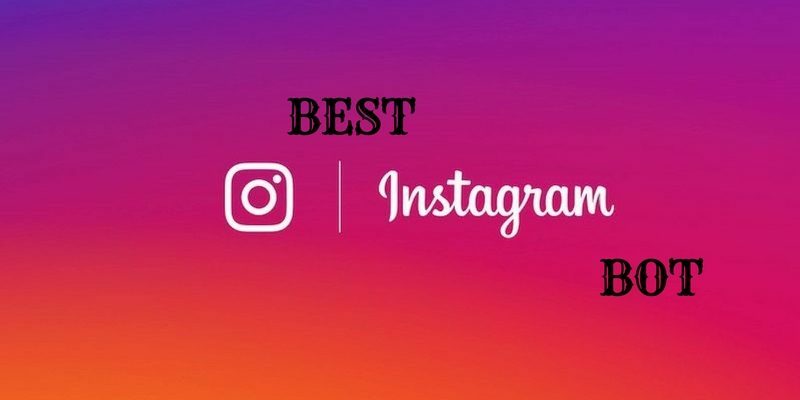 Users who have reviewed this Instagram automation software appreciate its user-friendly interface and its level of accuracy. Followadder users have been able to grow their following and generate leads while having full control over its management software. Bulk Uploading and Scheduling – Users can publish photos throughout the day, updating followers and have them on their toes for your next move. Create Customizable Lists with Follow & Unfollow Option – Users have the option to create, import and export fully customizable lists. Within these lists, you can unfollow accounts or create white lists to ensure some accounts are never unfollowed, and black lists to never follow specific profiles. Scapes Images, Hashtags, and Profiles to Like, Comment, or DM – Users can scrape images, comments and messages previously liked or used, to repeat the same actions on similar posts or profiles. This helps to personalize their engagement. FollowAdder doesn’t suggest which profiles you should be following. If you are looking for more options, we’ve gathered FollowingLike Instagram Bots, in addition to Followadder and Instazood. FollowingLike lets users run several social networking accounts to have automated features. What attracts customers most to this Instabot is its ability to simulate human operation. With so many Instagram automation services being shut down, users use this feature to avoid getting their Instagram account suspended. Multiple Account Management – In addition to Instagram, users receive automates services for Facebook, Pinterest, Tumblr, Reddit and more. 24/7 Auto Follow, Auto Unfollow, Auto Like/Unlike, Auto Comment, DM, Share & Post – Basically anything a user is capable of, this Instabot can do. Auto Task Scheduling – Users can plan ahead using FollowingLike’s this feature by scheduling posts to go out in the future. Content Spinning – Users can post the same content across all social media platforms. Proxy Rotate Method – FollowingLike’s Instabot simulates human operation. Since this past April (of 2017), Instagram bot users spiraled into a panic when Instagress, a popular Instabot software, shut down as requested by Instagram. A month later, Mass Planner (another Instabot company), announced its termination – Again, requested by Instagram. Both companies were forced to shut down their services for violating Instagram’s API Terms. In spite of this rule, people still use Instagram Bots at their own risk. Some speculate that Instagram has these rules to eliminate competitors as Instagram itself is a marketing platform. Either way, having these rules encourages users to publish content that holds more quality and value. 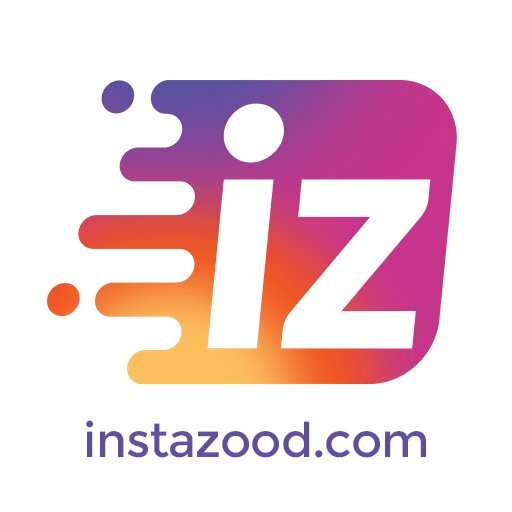 Instazood focuses on hashtag targeting. Users who use Instazood benefit from its hashtag features as each hashtag comes with a set of data analytics. Some users choose this automation tool because it also allows individuals to manage multiple accounts. Hashtag Features – Instazood relies on hashtags. Each hashtag is counted as a targeted demographic and displays which hashtags are helping you to gain more traction to your profile. Auto Like, Follow, Unfollow, Comment & DM – Like most Instagram Bots, Instazood also includes these standard features. Comment Tracking Tool – Users can delete or flag comments that require a manual response at a later time. 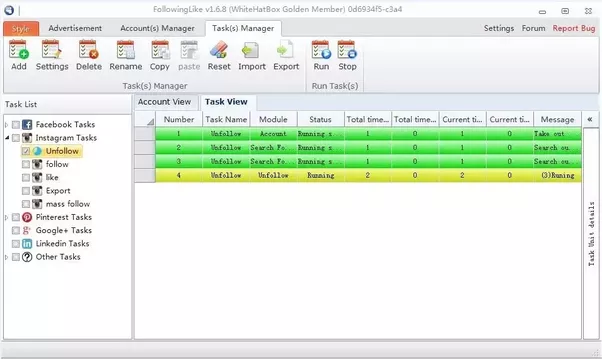 Manage Multiple Accounts – Users can manage multiple accounts from one dashboard. 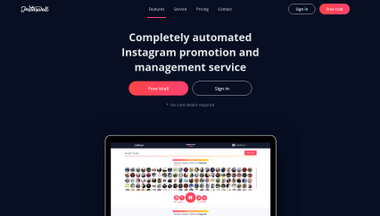 Auto Insta Bot Activity Tracker – Users can track their Instabots productivity at any time of the day. Schedule Posts – Users can bulk upload posts to be published at any time of the day to save time. You can select which package best suits your practice at an affordable price. Instead of being able to add hashtags in bulk, each hashtag must be plugged in manually to be registered as separate algorithms. Users say the interface is confusing. Instaswell offers standard Instabot services: Auto-follow and unfollow. And Instaswell helps users to stay organized with its notification and managing tools. Instawell ensures its Instabots do not repeat behaviors. Instaswells managing and “no repeats” features allows its users to stay organized with their activities. Instaswell’s automated tools are only limited to auto-follow, unfollow and like. You cannot further customize these parameters with blacklists or white lists. Instagress Alternative does not involve any downloads to your phone. Users can use Instagress from any browser on the web. This Instagram automation service is mobile friendly and offers the same services as Instagress (recently shut down). Auto-Like, Auto – Follow/Unfollow, Auto Comment, Auto-Geotagging – These are all based on user’s target hashtags. Must be done managed on a web browser. This could complicate the user’s experience. Archie’s easy concept attracts clients to use its Instabot software. Users enjoy its super targeting features and can live without additional features like auto-liking, commenting or direct messaging. Its main focus is to gain followers from the right profiles. Auto Liking, Auto Follow – Users determine Auto Liking and Auto Following by their chosen hashtags. Auto Block User & Hashtags – Users can block other profiles or block certain hashtags to avoid the Instabot from engaging with profiles that contain specific hashtags. Engage by Geotags & Location – Archie bots engage with other users who have posted in the same location as yourself. 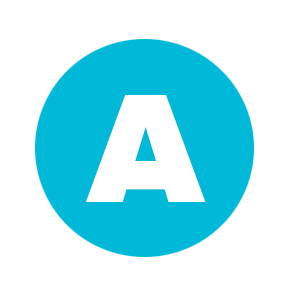 Supertargetting – Archie targets followers who follow competitors or profiles that are in a similar niche as yourself. Archie’s Supertargetting feature helps users gain insight on their demographic. Certain users prefer that it does not have auto-comment or auto DM features because they consider these to be too artificial. Does not include auto-comment or auto DM which would save users a lot of time. 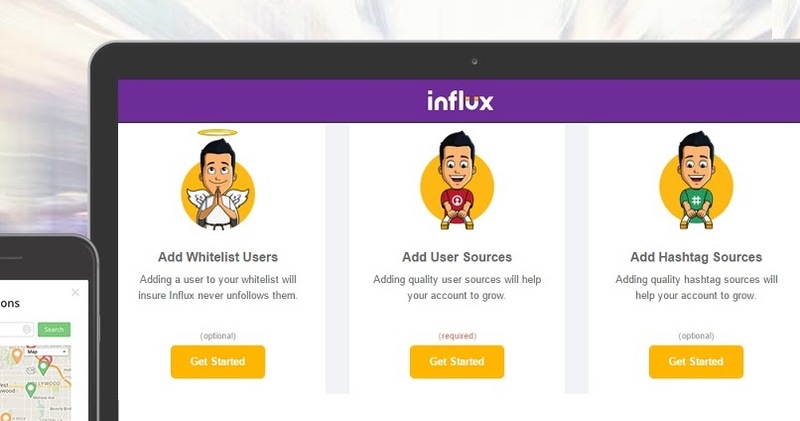 Influx Social has a simple and easy-to-use interface with 3 categories: Users, Hashtags, and Location. Users have the option to customize at what pace they would like to grow their following using a slide bar in the settings indicating speed. This software is uncomplicated and contains standard Instagram Bot services. Auto-Follow, Auto-Like – This is done through selecting hashtags. Geotags and Locations – Track profiles who have tagged the same locations. Choose your Speed – Users have the option to select how fast they want to follow others to determine the speed of your growth. The best way to use Instagram Automation is to use it in areas where being “original” does not matter. Take advantage of its hashtag settings to find your demographic and use the automated scheduling features to save time for posting. Plan ahead to stay relevant and enhance your feed by making it visually consistent. These are the safest automation strategies that do not impede on your authenticity. Users should invest time in liking, and more importantly, manually comment on posts instead of using automated services. Engagement takes time and personalization – something an Instabot cannot do. If followers suspect that you are using automation tools, your brand risks being labeled unethical or fake. The key to using Instagram automation is to use it to find out more about your niche. It should not be used to do the “work” for you. If however, you do choose to use Instagram Automation, we recommend users to subscribe to FollowingAdder. It does the most accurate job in customizing who to follow, it is easy-to-use, tracks your success and allows users to schedule in advance. As a result, FollowingAdder has the highest ratings and has helped many to gain a bigger following.